Tell me you don’t want to look cute and stylish while you are working hard and breaking sweat during your workout! Of course you would like to look stylish and polished even when you are in beast mode at the gym! The easiest to achieve that stylish polished look at the gym is to color coordinate your workout clothes. You can choose colored tops and gym bottoms. Brightly colored sports bras, leggings, capris and shorts are a real hit now at the gym! You can even choose patterned bottoms as your sportswear for the gym. However, most women like to play it safe and choose black bottoms. Choosing to wear black yoga pants to the gym is easy, simple, and it doesn’t require too much thinking because everything goes with black. I admit, I only own black workout pants too, because it is the only color that I can get away with having a sweaty booty at the gym and not looking like I peed myself during heavy workouts. So what if you are not into wearing colored sports bottoms either, then what other options are there left to look more stylish at the gym? Luckily bright colored gym shoes are also highly popular. It provides you with the option to pair your black gym bottoms with a bright colored top that matches the color of your gym shoes. If you feel that you are bad at matching different colors together, but still want to achieve a stylish look, simply wear one color in your outfit and everything else should be a neutral color (black, white, gray, navy). Using one color will add a little pop to your workout wear, but won’t clash with other colors – thus making you stylish in no time! A cheap solution to become instantly stylish at the gym is to get the color of a headband to match the color of your pants or gym shoes. Easy and it really makes you look stylish in no time! Just be sure to get stylish headbands designed for sports that have a no slip grip or that silicone grip that keeps stray locks and the band itself in place! 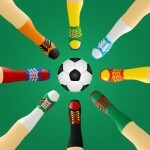 Match the color of your socks to your top and/or headband! Socks are an important part of your workout wear (unless you are doing barefoot yoga), because they provide the cushion between your skin and your shoe. Experts say that you should invest in gym sock with cushioning on the sole in the form of microfiber fabrics which are designed to wick away moisture from your skin. So choose some colored socks that match your other workout clothing and hit the gym in style! Hair needs to get out of your way when you are exercising at the gym! If you have long hair, then getting a colored ponytail holders is an easy and cheap way to pump up your style! You can mix and match here freely. If your bra is visible under your t-shirt, use a ponytail holder that matches the color of your sports bra. Or use a ribbon that matches the color of your gym shoes. If you are more experienced with matching different colors, then you can use multiple colored hair elastics to accent the colors represented in your sportswear. Feel free to play and become stylish easily! Personal trick of mine: if you are into active sports like running, for a firmer ponytail use two hair ties on top of each other. They give you the grip and firmness needed. Those with long hair should try different braided hairstyles their next workout session at the gym. 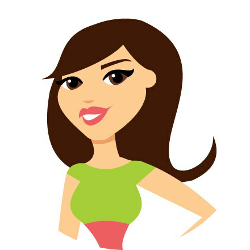 There are tons of do’s for active ladies on Pinterest with tutorials on how to achieve the gym hairstyle look. Great thing about braided hair is that you can do it in the morning before work, and it will last all day long! Plus you will look stylish at the gym too! Check out my Pinterest board for some hairstyle inspiration to become stylish at the gym! 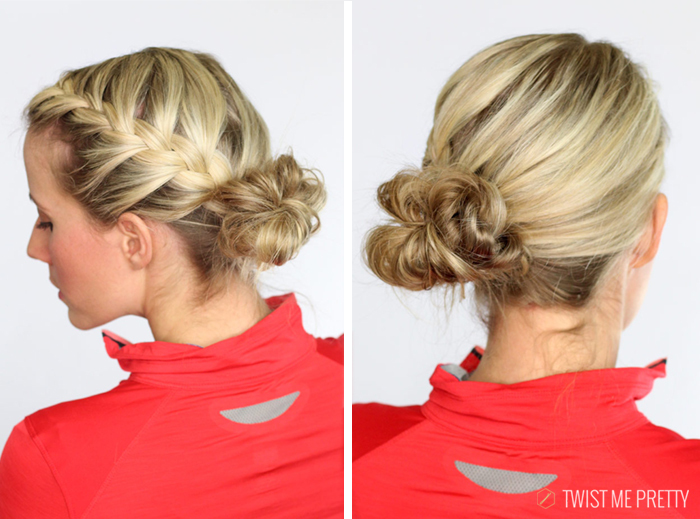 Classic french braided messy bun in no time! This isn’t sweat – it’s liquid awesome! Let your stylish t-shirt do the talking for you at the gym!